Dr. Chil-Yong Kang from the Schulich School of Medicine and Dentistry at the University of Western Ontario. 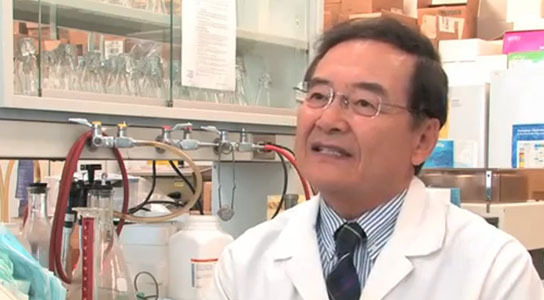 Dr. Chil-Yong Kang and his team at The University of Western Ontario have been studying HIV for the last twenty years and working on a vaccine for the last ten years. They recently received approval by the USFDA to start human clinical trials. Their vaccine is unique in that it uses a killed whole HIV-1, unlike other vaccines that focused on either one specific component of HIV as an antigen, genetic vaccine using recombinant DNA, or recombinant viruses carrying the HIV genes. A potential first and only preventative HIV vaccine, developed by Dr. Chil-Yong Kang and his team at The University of Western Ontario, has received approval by the United States Food and Drug Administration (USFDA) to start human clinical trials this month south of the border. With the support of Sumagen Canada, and based on a genetically modified killed whole virus, the vaccine holds tremendous promise, having already proven to stimulate strong immune responses in preliminary toxicology tests with no adverse effects or safety risks. With the USFDA holding the most stringent approval requirements, Kang chose to go this route with the only HIV vaccine currently under development in Canada – and one of only a few in the world. “FDA approval for human clinical trials is an extremely significant milestone for our vaccine, which has the potential to save the lives of millions of people around the world by preventing HIV infection,” says Kang, a researcher and professor at Western’s Schulich School of Medicine & Dentistry. HIV/AIDS has killed more than 28 million people worldwide, and more than 35 million people currently live with the virus. Since the virus was first characterized in 1983, there have been numerous trials through pharmaceutical companies and academic institutions around the world to develop vaccines; however, no commercialized vaccine has been developed to date. Other vaccines evaluated through human clinical trials have focused on either one specific component of HIV as an antigen, genetic vaccine using recombinant DNA, or recombinant viruses carrying the HIV genes. Kang’s vaccine is unique in that it uses a killed whole HIV-1, much like the killed whole virus vaccines for polio, influenza, rabies and hepatitis A. The HIV-1 is genetically engineered so it is non-pathogenic and can be produced in large quantities. Before it can be commercialized, the vaccine must go through three phases of human clinical trials. If all goes well, the vaccine could be made available within five years. Western News reporter Paul Mayne sat down with Kang in his lab to talk about the significance of his ongoing work and the implication this latest breakthrough may have around the world. WN: Tell me a bit about your ongoing research here at Western. Kang: We have done the development of AIDS/HIV vaccine for the last 10 years and actually started the research 20 years ago. The first 10 years we have done all the basic science research; for the last 10 years we have been developing the vaccine. This vaccine is a prophylactic vaccine, which is preventive vaccine, which we submitted for human trials to USFDA in June 2009. They came back to look for answers to two questions they had. First, that it does not contain any live virus; second, we had to demonstrate to them the vaccine did not contain more than 10 nano grams of human DNA. Since we are using this vaccine as a kill-the-whole-virus vaccine, those two questions were very important and legitimate. We spent about a year to answer those questions and we now have done so. WN: You’ve been at this for 20 years now. While each step is important in reaching your goal, how big is the landmark moment? Kang: It is a very important milestone. In all these years of research and development, we knew we would have to go through this specific stage in order to get the vaccine to trial and see if it is efficacious in humans to prevent HIV infection. We have done years of work and this is now the stage where we can test this vaccine in human bodies to see whether it can trigger immune responses which can protect humans from HIV infection, so it is very exciting. WN: While the human trials begin this month, why will it be five years before we will see this more widely available to the general public? Kang: There are three phases of the human clinical trials. Phase 1 will look at whether or not this vaccine is toxic in human bodies, with a small group of about 40 people will be tested. It will take maybe three months. The Phase 2 human clinical trials will look at the immune responses with our vaccine to see whether immunized people will induce the proper immune responses to protect themselves from natural infection. That will take about a year or so. The final phase is important and will be the efficacy test. For Phase 3 we will need about 6,000 people to test to have significant data. We will vaccinate the people and then wait for natural infection. So we will have 3,000 people vaccinated and another 3,000 people as a control group, and then we’ll have to wait about three years time to see if those vaccinated people are protected, while the non-vaccinated control group will come down with a certain level of viral infection. We then can compare the vaccinated and non-vaccinated groups to see how effective this vaccine is for prevention of HIV infection. WN: You have the only vaccine currently under development in Canada, and one of only a few in the world. How confident are you in your vaccine? Kang: We are using the technology which has been proven to be effective. The kill-the-whole-virus approach for vaccine development works for the flu virus vaccines, polio vaccines, rabies vaccine, hepatitis vaccine and so on. So we are using this kill-the-whole-virus vaccine as preventive vaccine. No one has tried this conventional method to develop an HIV vaccine and we are using the proven technology, although we have modified the HIV genes in the laboratory. We have genetically modified our virus and then produce them in large quantities, in-activate them and then use that as a kill-the-whole-virus vaccine, which is conventional wisdom since it works with the other viral infections. I hope it will work for HIV as well. Kang: (It means) the virus is produced from infected cells. We infect the cells with the virus and then the infected cells will produce lots of virus, and we can collect them, purify them and then inactivate them. We are inactivating with two different methods, by chemical inactivation and then by radiation, and neither will alter the structure of the virus. The virus itself is introduced to the human body, and the human body will react to this and produce antibodies and proper immune responses, so our body can be protected from natural infection. WN: Have you given yourself the time to take a step back and really take in what it is you’re working toward and the significance it may have worldwide? Any other work you have underway? Kang: We cannot take the time out. What we have done so far is prophylactic vaccine; it is preventive. This is to prevent HIV infection from non-infected individuals. We are now developing a therapeutic vaccine. The prophylactic vaccine may not be effective to treat people with HIV infection already. So we are now making a vaccine which can treat the viral infection and clear the virus infection. Retro viruses, like HIV, when it is reproduced this DNA gets into our cells and integrates into the chromosomal DNA and stays there for long time and that creates a persistent infection. That’s why it’s very difficult to get rid of it and therefore we cannot use the live virus vaccine but the kill-the-whole-virus approach instead. Now, this vaccine will not help the virus-infected individuals. To help those people, to prevent the development of full-blown AIDS from initial infection, we need a therapeutic vaccine to hopefully educate our white blood cells so they can destroy and clear the viral infection. Those people who are infected, but not yet developed AIDS, are totally immune competent, which means they can react to the vaccine and be protected from the development of AIDS and that’s how we want to help. At the moment, we are developing a therapeutic vaccine and are at the stage where we can test the vaccine in animals and can see if they develop good immune responses. God willing, this latest vaccine will prevent the infections, and our strategy will then be to work towards a therapeutic vaccine for those already infected. Be the first to comment on "HIV Vaccine Approved for Human Clinical Trials"